Nobody felt like anything fancy on Mother’s Day. That’s usually our trend. Stay away from the crowded places on the holidays only to return to have a quieter meal on a weekday. So when I asked the mother of my children where she wanted to go, she said she was in the mood for Smashburger. Another bonus in the selection of her in this role. 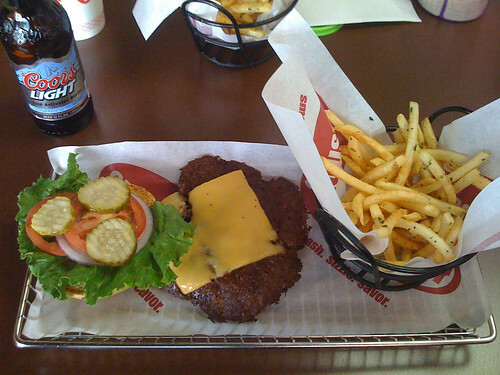 Smashburger is not new to me of course but I have been re-visiting the burger war veterans to give a more detailed pictorial review. Hence, this post. I have been working my way through various combinations at Smashburger and this is what I have settled on as my perfect choice. This is the classic Smashburger hold the ketchup. I just don’t like ketchup. I get the 1/3 pound when its lunchtime and I go for the 1/2 pound at dinner when I am extra hungry. Tonight was a 1/2 pound night. Served with the delicious Smashfries. They do have a decent milkshake but it tends to make me want to undo a top button on my pants from too much caloric intake. So I am usually a good boy and skip it unless I ran for 2+ hours that day and I deserve it. Another popular option I like to go for is adding Haystack Onions to the burger. They are like thin thin onion rings. I actually ordered them tonight but didn’t realize until a few bites in that they had forgotten them. I went up and made my failure claim and they refunded the differential and gave me a coupon for a free burger next time. Felt like I profited in that transaction! The kids eat well here with choices of hot dogs and chicken nuggets. My kids don’t like hamburgers. Kim continues to get the Smashchicken which is rather tasty. I usually get a bite or 2 of her scraps and always tell myself I will order one…next time. Anyway, Smashburger remains my local burger #2 spot. Barely losing out to #1. And if the kids are with me, I usually always go here because they have things they like. When alone, it almost depends on my mood. However, I am glad that more of these are sprouting up around Colorado. New one opened in Boulder recently. Now, if we can just get one in Longmont, I would be all set.